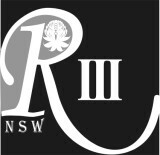 Don’t forget that the April meeting this year is on Saturday, 21 April 2012 – at the usual place of course: The Sydney Mechanics School of Arts, 280 Pitt Street, Sydney. The speaker will be Dorothea Preis on “Richard and Learning”. Many of you will remember her talking about this in a Scrabble talk but, with those talks’ time limitations, Dorothea felt that she had barely started on the subject. So, lucky us, this time we get the extended version. You can count on it being entertaining, well-researched and with illustrations from Dorothea’s collection. Get ready to put up your hand to give a short Scrabble talk at our August meeting. New members should know, volunteers draw a Scrabble tile and then prepare a talk on a medieval subject beginning with that letter at a meeting later in the year. The talks should be no longer than 15 minutes.